Get the kids in the kitchen to make these classic pizza calzones. 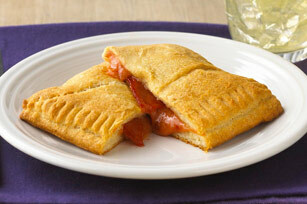 Stuffed with cheese and pepperoni, they'll love these homemade pizza pockets. Divide dough into 6 equal portions. Pat each portion into 6-inch circle on baking sheet sprayed with cooking spray. Mix pizza sauce and Parmesan in medium bowl. Add pepperoni and shredded cheese; mix lightly. Spread onto half of each dough round; fold in half. Firmly press edges together with fork to seal. Brush with egg; prick tops with fork. Bake 15 to 20 min. or until golden brown. Cool 5 min. Prepare as directed, adding 1/2 cup chopped ham and 1/4 cup chopped pineapple to the calzone filling. Prepare as directed, omitting the pepperoni and adding an extra 1/2 cup of your favourite Kraft Shredded Cheese to the calzone filling. Prepare as directed, substituting 2 wieners, cut into 1/2-inch-thick slices, for the pepperoni.